Comments: Evergreen Conifer native to New Caledonia Island in the Pacific. This tree, originally described by Brittish explorer Captain Cook, is a very columnar tree similar in character to the Norfolk Island Pine. Soft and inwardly curved needles surround the branches. 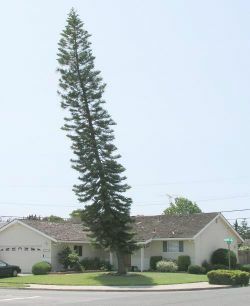 This tree has been tentatively identified as Araucaria columnaris.